Colonies of Burkholderia pseudomallei, one of many pathogenic Betaproteobacteria. The Betaproteobacteria are a class comprising over 75 genera and 400 species of bacteria. Together, the Betaproteobacteria represent a broad variety of metabolic strategies and occupy diverse environments from obligate pathogens living within host organisms to oligotrophic groundwater ecosystems. Whilst most members of the Betaproteobacteria are heterotrophic, deriving both their carbon and electrons from organocarbon sources, some are photoheterotrophic, deriving energy from light and carbon from organocarbon sources. Other genera are autotrophic, deriving their carbon from bicarbonate or carbon dioxide and their electrons from reduced inorganic ions such as nitrite, ammonium, thiosulfate or sulfide  - many of these chemolithoautotrophic Betaproteobacteria are economically important, with roles in maintaining soil pH and in elementary cycling. Other economically important members of the Betaproteobacteria are able to use nitrate as their terminal electron acceptor and can be used industrially to remove nitrate from wastewater by denitrification. A number of Betaproteobacteria are diazotrophs, meaning that they can fix molecular nitrogen from the air as their nitrogen source for growth - this is important to the farming industry as it is a primary means of ammonium levels in soils rising without the presence of leguminous plants. Photoheterotrophs are heterotrophic phototrophs—that is, they are organisms that use light for energy, but cannot use carbon dioxide as their sole carbon source. Consequently, they use organic compounds from the environment to satisfy their carbon requirements; these compounds include carbohydrates, fatty acids, and alcohols. Examples of photoheterotrophic organisms include purple non-sulfur bacteria, green non-sulfur bacteria, and heliobacteria. Recent research has indicated that the oriental hornet and some aphids may be able to use light to supplement their energy supply. 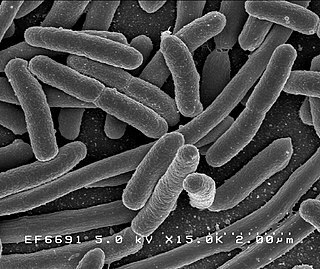 The Oxalobacteraceae are a family of bacteria, included in the order Burkholderiales. Like all Proteobacteria, Oxalobacteraceae are Gram-negative. The family includes strict aerobes, strict anaerobes, and nitrogen-fixing (diazotrophic) members. The cells are curved, vibroid, or straight rod-shaped. The Sutterellaceae are a family of the Betaproteobacteria. Cells of Sutterellaceae are Gram-negative, oxidase- and catalase-negative, and grow under microaerophilic or anaerobic atmospheres. Nitrification is the biological oxidation of ammonia or ammonium to nitrite followed by the oxidation of the nitrite to nitrate. The transformation of ammonia to nitrite is usually the rate limiting step of nitrification. 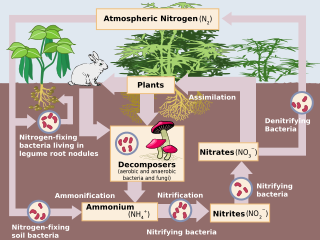 Nitrification is an important step in the nitrogen cycle in soil. Nitrification is an aerobic process performed by small groups of autotrophic bacteria and archaea. This process was discovered by the Russian microbiologist Sergei Winogradsky. The Acidithiobacillales are an order of bacteria within the class Acidithiobacillia and comprises the genera Acidithiobacillus and Thermithiobacillus. Originally, both were included in the genus Thiobacillus, but they are not related to the type species, which belongs to the Betaproteobacteria. "Candidatus Brocadia anammoxidans" is a bacterial member of the order Planctomycetes and therefore lacks peptidoglycan in its cell wall, and has a compartmentalized cytoplasm. Microbial metabolism is the means by which a microbe obtains the energy and nutrients it needs to live and reproduce. Microbes use many different types of metabolic strategies and species can often be differentiated from each other based on metabolic characteristics. The specific metabolic properties of a microbe are the major factors in determining that microbe's ecological niche, and often allow for that microbe to be useful in industrial processes or responsible for biogeochemical cycles. 1 2 Slonczewski JL, Foster JW (2014). Microbiology: An Evolving Science (3rd ed.). W. W. Norton & Company. pp. 742–3. ISBN 9780393123678. 1 2 Dworkin M, Falkow S, Rosenberg E, Schleifer KH, Stackebrandt E, eds. (2006). The Prokaryotes, Volume 5 - Proteobacteria: Alpha and Beta Subclasses (3rd ed.). Springer. pp. 15–18. doi:10.1007/0-387-30745-1. ISBN 9780387254951. 1 2 3 4 5 6 7 Boden R, Hutt LP, Rae AW (2017). "Reclassification of Thiobacillus aquaesulis (Wood & Kelly, 1995) as Annwoodia aquaesulis gen. nov., comb. nov., transfer of Thiobacillus (Beijerinck, 1904) from the Hydrogenophilales to the Nitrosomonadales, proposal of Hydrogenophilalia class. nov. within the Proteobacteria, and four new families within the orders Nitrosomonadales and Rhodocyclales". International Journal of Systematic and Evolutionary Microbiology. 67 (5): 1191–1205. doi:10.1099/ijsem.0.001927. PMID 28581923. ↑ J.P. Euzéby. "Betaproteobacteria". List of Prokaryotic names with Standing in Nomenclature (LPSN). Retrieved 21 May 2017. ↑ Horn M, Fritsche TR, Linner T, Gautom RK, Harzenetter MD, Wagner M (2002). "Obligate bacterial endosymbionts of Acanthamoeba spp. related to the beta-Proteobacteria: proposal of " Candidatus Procabacter acanthamoebae" gen. nov., sp. nov". International Journal of Systematic and Evolutionary Microbiology. 52 (2): 599–605. doi:10.1099/00207713-52-2-599. PMID 11931173. ↑ Dworkin M, Falkow S, Rosenberg E, Schleifer KH, Stackebrandt E, eds. (2006). The Prokaryotes, Volume 5 - Proteobacteria: Alpha and Beta Subclasses (3rd ed.). Springer. p. 11. doi:10.1007/0-387-30745-1. ISBN 9780387254951. 1 2 Bonnet, C.; Volat, B.; Bardin, R.; Degranges, V.; Montuelle, B. (March 1997). "Use of immunofluorescence technique for studying a Nitrobacter population from wastewater treatment plant following discharge in river sediments: First experimental data". Water Research. 31 (3): 661–664. doi:10.1016/S0043-1354(96)00094-2. 1 2 Prasad, V. S. R. K.; Siva Prasad, V. G. S. G.; Sridevi, Venigalla; Sudarsan, K. G. (September 2015). "Biodegradation of Ammoniacal Nitrogen to Nitrite in an Industrial Effluent using Nitrosomonas species: First stage in Nitrification". Journal of Chemical, Biological and Physical Sciences. 5 (4): 4733–4740. ↑ Cydzik-Kwiatkowska, Agnieszka; Zielińska, Magdalena (Mar 2016). "Bacterial communities in full-scale wastewater treatment systems". World J Microbiol Biotechnol. 32 (66): 66. doi:10.1007/s11274-016-2012-9. PMC 4773473 . PMID 26931606.